Dr. Heidi Horsley discusses teens and grief with Molly Pickett, who works with the Tamarack Grief Resource Center. Pickett began her grief journey at just 12 years old when her father died by suicide. She considers herself fortunate to participate in camps at Tamarack. For her, the biggest help was knowing that she was seen. She had people who were caring and compassionate. Tina Barrett, the manager of Tamarack, saw Pickett in the camps and told her what might be helpful. Pickett’s mother was in her own grief journey, and used silence as a way to cope. Teens need to be seen, and it’s a challenge for many. As a teen, everything in your life is changing anyway. The bottom falls out when you lose someone you love. It’s easy to get lost at this point. You can be seen as unapproachable. People don’t know what to say or how to handle you anymore. This can be true of friends and family alike. “How are you?” and “what do you need today?” are two questions that teens need. Being seen as someone who matters in a crowd is critical. Validate their losses and acknowledge them. 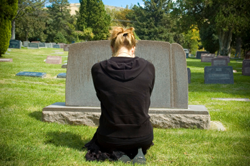 People often look to parents and adults after a loss, and that’s where all the support goes. Don’t forget about the kids, because they’re grieving, too. Dr. Horsley relates, having lost her brother when she was away at college. It can be even more difficult for an adult sibling, as they’re often seen as if they have “moved on” from the family unit. Pickett encourages anyone who is a teen or knows a teen in grief to identify nearby support networks. Tamarack is one of many around the country. Getting professional support and help can make all the difference for a teen who’s feeling lost.